The win has taken Exter Chiefs tally to 65 points as they extend their lead at the top to 11 points while Bath Rugby are at the sixth position with 46 points. Simmonds kicked a sixth minute penalty goal to kick-start the proceedings for Exeter Chiefs and 16 minutes later they extended the lead to 10 points with Jonny Hill crossing over allowing the fly-half to kick the extras. Bath finally managed to get their first points on the board with back to back penalties in the 28th and 38th minutes as they reduced the trail to 6-10 at half time. 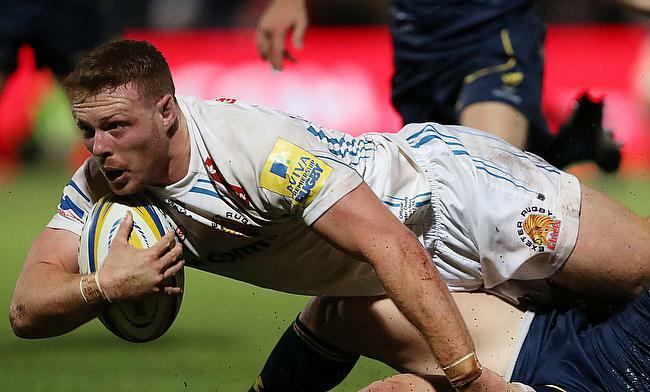 Sam Simmonds extended the gap with his 48th minute try and with Joe Simmonds improving it, the Aviva Premiership champions had a lead of 6-17. Burns played a key role in Bath's revival as he chipped one into Exeter 22 allowing Matt Banahan to go past the line. Burns' replacement Rhys Priestland allowed Taulupe Faletau breach Exeter's defence before the Wales number eight sent Paul Grant over to score Bath's second try as the home side had a lead of 18-17 with 13 minutes to go in the game. As the game was heading for a tight finish, Joe Simmonds held his nerve in kicking the crucial 75th minute penalty to complete an 18-20 win for Exeter Chiefs.